Airedale Terriers originated from Aire River region of England primarily by crossing a Terrier with an Otter Hound in the middle 1800s. The exact strain of terrier or likely terrier types utilized is the subject of some controversy. Most accounts state that the Black and Tan Terrier or Broken Coated Terrier were used. These dogs were used by the working class Yorkshiremen to hunt down the large rats that occupied the banks of the Aire River and tributary streams. These highly competitive matches drew many spectators from the surrounding community. The Terriers searched the stream banks for rat holes and swam from side to side when necessary under the intense direction of their owners (Edwards 1982, Dutcher and Framke 1990). The dogs selected "live" holes upon which a ferret was inserted to drive out the unhappy rodent. Once dislodged, the rat typically bolted into the water with the dogs in quick pursuit. 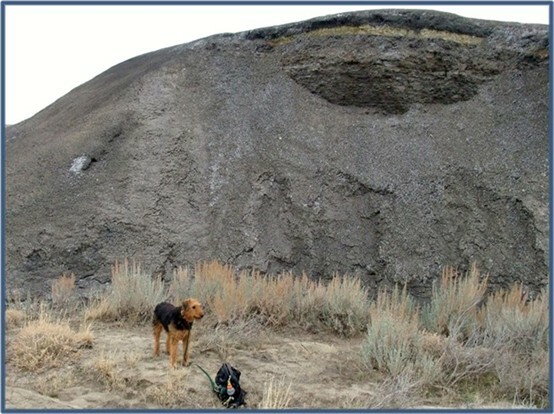 The dog that selected the burrow was allocated two points while the dog that killed the rat received one point (Cummins 1994). These competitions continued into at least the 1950s using Airedales. Weighing around 20 or so pounds, these small rugged Terriers ranged from red to black and tan in color with varying extents of gray, grizzle, sometimes mixed in. Coats were generally hard and wiry, but smooth and nearly wooly coated dogs occurred. The initial Otter Hound and Black and Tan Terrier breeding was purportedly accomplished in 1853 near Bradford (Dutcher and Framke 1990). Often referred to as the Waterside Terrier, the resulting dogs gained considerable size and strength and a great fondness for water. Retaining the Terrier demeanor, the dogs could adeptly hunt larger varmits. The Bull Terrier was possibly later crossed in to a lesser extent. The Airedale was acknowledged as a distinctive breed by 1879 (Strebeigh and McCready 1977). In addition to companions, the Airedales were well respected for their versatility and hunting abilities. The dogs were used to hunt a variety of creatures regarded as nuisance predators such as polecats, martens, badgers, otters, and foxes. Despite their diminutive size, otters are very feisty with strong bites. By the late 1800's, Airedales were used in the United States for the hunting of coyotes, raccoons, bobcats, and badgers. 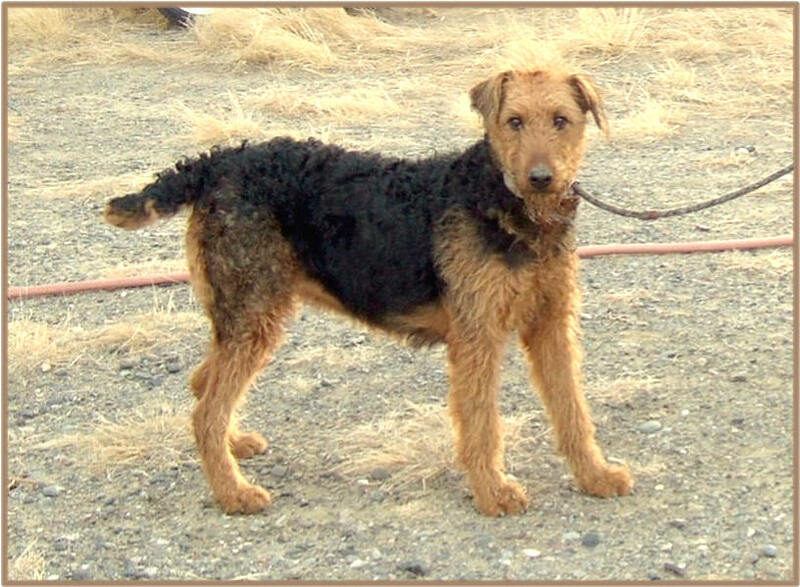 In the early 1900s, an Airedale or Airedale cross was often included in packs of dogs used to tackle bears (including the large grizzlies) and mountain lions (Cummins 1994). Fond of water, Airedales were also used as bird dogs retrieving pheasants, ducks, etc. Quite hardy, the dogs would enter the water even in cold conditions. Historically, Airedales served important functions around the farm in both the United States, Canada, and Britain. In addition to assisting with livestock drives, the dogs kept the animals within their designated areas and guarded them from predators. With sufficient training, the highly versatile breed could herd varieties of livestock including pigs sheep, cattle, goats, etc. as well as protect them. Airedales were capable of serving as companions, herders, guard dogs, and sporting dogs (Hotchwalt 1921). As the twentieth century progressed, Airedales entered into a variety of new occupations. In addition to serving as security and police dogs, quite a few joined the British military during World War I. British Colonel Edwin Hautenville Richardson extensively trained Airedales and a few other breeds for the War Dog Program (Richardson 1929). Airedales functioned as sentries, messengers, and communication dogs which laid out wire across dangerous zones. The latter canine transported a reel of wire attached to his back which strung out as the dog walked along. By the latter twentieth century through present, people discovered more careers for the multitalented Airedale. These Terriers are now used as therapy dogs, search and rescue, assisting the physically challenged, backpacking, etc. as well as their historic occupations. Proficient in a very broad range of activities, the breed possesses a degree of versatility not known in most dog breeds. Cummins, Bryan 1994. The Working Airedale. OTR Publications, Canterville, Alabama. ISBN 0-940629-07-4. Dutcher, June and Janet Johnson Framke 1990. The New Airedale Terrier. Howell Book House, Macmillian Publishing, New York City. ISBN 0-87605-007-0. Edwards, Gladys Brown 1982. The New Complete Airedale Terrier. Third Edition. Howell Book House, New York City. ISBN 0-87605-005-4. Hochwalt, A.F. 1921. The Airedale For Work And Show. Boxer Books, Toccoa, Georgia. ISBN 0-9653624-2-6. Richardson, Edwin Hautenville 1929. Forty Years With Dogs. Hutchinson, London. Strebeigh, Barbara and Pauline I. McCready 1977. Denlinger, Fairfax, Virginia. ISBN 0-87714-040-5. Please feel free to call us at 307 754-3426 or email us at airedale@tritel.net for info on our dogs.